From the bush of Baradine to the corridors of Canberra, this is Craig Emerson’s story of triumph and courage over adversity. In the mid-1960s, in the small town of Baradine in north-western New South Wales, the Emerson family was in continual crisis. The mother suffered from deep depression, and the father was exhausted by their constant fights. The two sons - Craig and Lance - were traumatised by their mother’s mental struggles and inexplicable outbursts of violence against them. Yet both parents worked hard for meagre wages to give Craig a good education, and he vindicated their sacrifice. After gaining a PhD in economics, he was invited to join Bob Hawke’s staff to help design and implement the Labor government’s economic and environmental program. Craig became like a son to the prime minister; he and Bob worked hard, but also relished time out for betting, joking, and singing. During Craig’s own roller-coaster journey as a politician, factional powerbrokers exiled him to the backbench, but his perseverance and abilities earned him the honour of becoming Australia’s minister for trade and higher education. 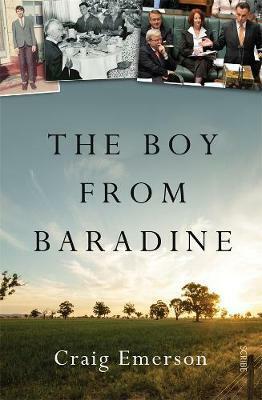 The Boy from Baradine is an unusual ex-politician’s memoir. It is a deeply human tale of trauma and triumph, of fear and fun, of character overcoming adversity. It will also inspire young people that it is possible to succeed from the most unlikely of personal circumstances.